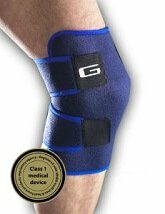 Arthritis knee braces are designed to relieve the pain and swelling associated with arthritis. Arthritis is very common problem and affects around 50 million Americans, approximately 22% of the population. Arthritis braces work by reducing the pressure going through the arthritic parts of the knee and providing support and warmth. Here we will look at how different styles of arthritis braces work, what evidence there is to their effectiveness, how to choose the best brace for you including how to get the right size, and what to expect from the brace. 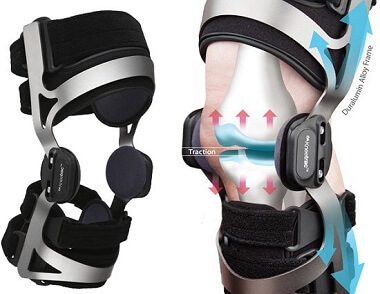 3) Unloader Arthritis Knee Braces: Unloader knee braces are specially designed to reduce the weight going through the parts of the knee affected by arthritis by changing the angle of the knee joint. Special hinges redistribute the weight to stronger parts of the joint. There are different unloader braces suitable for all severities of arthritis, mild, moderate and severe, but work best when only one side of the knee is affected. 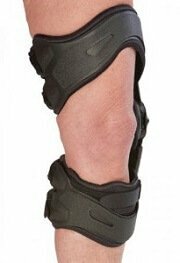 We will start by looking at Unloader arthritis knee braces as they are the ones most specifically designed for arthritis. Unloader arthritis knee braces work by reducing the weight going through the arthritic part of the knee joint and redistributing it to the healthy part of the knee. As a result, unloader knee braces work best for people whose arthritis is confined to one side of the knee joint. Most commonly, arthritis affects the medial (inner) side of the knee, while the lateral (outer) side of the knee is often unaffected, but sometimes it works in reverse. Unloader knee braces are more expensive than other types of arthritis knee brace, but that is because of their more complex design, which often makes them more effective. Many people find they get great relief from their pain when wearing an unloader arthritis knee brace, and it can delay or even prevent the need for surgery. 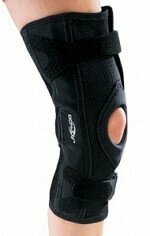 Donjoy arthritis knee braces are usually the best in this category. Overview: This is Donjoy's easiest to use osteoarthritis brace designed for moderate to moderate arthritis. It takes the weight off the arthritic side and redistributes it to the healthy side of the knee via a 3 point-load system. With the Donjoy OA Everyday you can easily adjust the load through the knee according to your activity levels (up to 6 degrees correction), and you can control how much flexion and extension the brace allows the knee to perform. 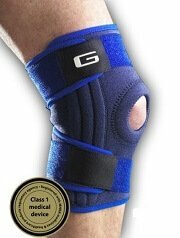 This arthritis knee brace was awarded a Commendation for Ease of Use by the Arthritis Foundation. It has a light weight frame, and swiveling, quick release buckles make it extremely easy to put the brace on and off. Pads and straps hold the brace in place while conforming to your shape for accurate fit. It is shorter than most other arthritis knee braces (12.5”) and is specially designed not to catch on the other leg. My verdict: This knee brace can work really well at easing arthritis knee pain by taking the weight off the affected part of the knee and redistributing it. It is expensive, but many people find this arthritis knee brace helps delay/prevent the need for surgery. Average user rating 4.8/5. Overview: The Donjoy OA Lite arthritis knee brace helps to slow arthritis progression by reducing the load on the knee. The pioneering technology with this brace gives instant relief from arthritis knee pain and can help delay the need for surgery. The angled hinge and condyle pad within the brace work together as a wedge to change the position of the knee joint. This relieves the 'bone on bone contact', which reduces friction and pain during your daily activities. My verdict: The Donjoy OA Lite is perfect if you have mild arthritis affecting one side of the knee. It provides more targeted support and offloading than general support knee braces, hence the price. Average user reviews 4/5. Overview: This arthritis knee brace is designed for use with mild to moderate arthritis. The padded lightweight frame and three point load system redistributes weight from degenerative (arthritic) parts of the joint to the healthy parts. With the Donjoy OA Assist you can control the load distribution and amount of rotation through the knee for optimum fit according to activity levels. It is specially shaped so it doesn’t catch on your other leg. The unique "3 Degrees of Freedom" hinge allows you to control the amount of flexion and extension that is allowed at the knee. My verdict: A simple to use arthritis knee brace commended by the Arthritis Foundation for ease of use. A great brace for reducing arthritis knee pain so you can continue with your normal daily activities. It is expensive, but that is due to the design complexity needed to redistribute the forces of the arthritic side of the knee – other more general knee braces won’t be able to do that. With all these Donjoy arthritis knee braces you can choose from two versions, Medial Compartment Version or Lateral Compartment Version – depending on which side of your knee that is affected by arthritis. 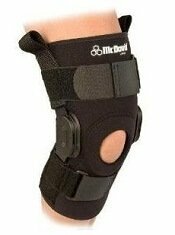 These arthritis knee braces provide great support for the knee joint, as well as helping to reduce swelling. They are great if your knee is starting to feel weak or unstable due to your arthritis, whether it is with sporting activities like skiing, or everyday activities such as walking. People often feel more confident knowing that they have some extra support. Overview: This Neo G knee brace provides great support and compression, and has metal spiral support stays to stabilise the knee whilst allowing controlled movement. It is particularly good for sports and skiing. The open patella area helps reduce pressure through the front of the knee. It has three adjustable straps which allow variable compression and ensure a custom fit around the entire knee complex. 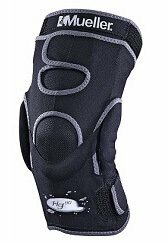 My verdict: The Neo G Stabilised Open Knee Support is one of the best braces on the market offering advanced support and protection for arthritis. The open knee prevents pressure going through the kneecap which is often uncomfortable with arthritis, and it allows the knee to breathe which is particularly useful if you are wearing it all day. You can adjust the size of the brace so it will fit during your good and bad arthritis spells, whether there is swelling or not. Average user rating 4.3/5. Overview: This brace has side hinges that provide great support. It is made of lightweight materials that accommodate the natural gliding action of the knee. The neoprene sleeve provides therapeutic warmth and it has a seamless, breathable back panel for improved comfort. The McDavid Pro has fully adjustable Velcro straps to ensure a perfect fit for your knee. My verdict: This is of the most popular hinged knee braces on the market. Users consistently give it top ratings because it is easy to apply, comfortable and effective. It provides good support so is great if your balance is starting to be affected by your arthritis. Average user rating 4.2. 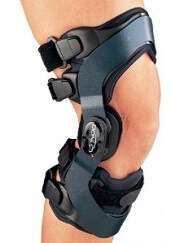 Overview: The hinges and springs in this brace provide good protection without limiting knee movement. It is made from Hydracinn fabric (latex and neoprene free) which provides good durability and heat management to prevent excessive sweating. The contoured inner sleeve and adjustable strap at the top ensures correct fit. A unique antimicrobial layer protects from bacteria and other micro-organisms, reducing odours. NB The US and UK versions look slightly different. My verdict: The Mueller Hg80 is a knee great brace for skiers and active sports people who are starting to feel limited by the arthritis knee pain. It is even made from special material to prevent it getting smelly! Average user rating 4.2. These are the most basic arthritis knee braces on the market, suitable for a variety of knee problems, including arthritis. They provide some support and warmth to the joint, as well as helping to reduce pain and swelling. They are most suitable in the early stages of arthritis. Overview: This Neo G knee brace provides compression, support and warming relief to the entire knee complex without restricting movement. At only 2.5mm thick, The Neo G Closed Knee Support can easily be worn under your clothes, providing dynamic support whilst still allowing full range of motion in all directions. My verdict: This brace provides great support and stays in place, better than many other knee braces. The adjustable straps means it will fit, even if your knee swells. It is made of neoprene material, helping it to retain heat increasing blood flow to the knee, which helps reduce arthritis knee pain. Average user rating 4.3/5. Overview: This ACE brace provides support and stability by simulating the action of the knee ligaments without restricting normal leg movement. It has flexible metal side stabilizers that provide medial and lateral stability. The ACE Brace With Side Stabilizers is designed for use with arthritis, general knee soreness and swelling. My verdict: This brace offers more protection than a simple pull on sleeve as it has side stabilisers to support your knee, perfect if your arthritis is starting to make your knee feel unsteady. Users rate it highly for comfort, support and durability. Average user rating 4.2/5. Overview: This Mueller knee brace is a lightweight, adjustable support that provides firm, comfortable compression without restricting movement. It has four patented straps that provide controlled compression and a perfect fit for your knee - especially helpful if you knee is prone to swelling with arthritis. 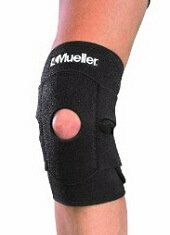 The open kneecap design of the Mueller Wrap helps to stabilise the kneecap without putting any pressure through it. Its contoured design and Velcro cover minimises bunching and prevents friction behind the knee. The soft neoprene blend retains heat for soothing warmth to help relieve pain and promote healing. One size fits most. My verdict: People find this arthritis knee brace really comfortable even when worn all day. It doesn’t cause any restriction behind the knee like some pull on sleeves do. Average user rating 4.1. Arthritis knee braces generally tend to be most beneficial for people with mild to moderate arthritis. The unloader braces can help with severe arthritis but I would recommend you discuss them with your doctor before purchasing any to check what is appropriate. It is vital that you get the right sized arthritis knee brace otherwise it will not provide the support you need and will likely be uncomfortable. The size guides below will allow you to find the right size for you. If your measurements put you between two sizes, it is usually best to opt for the larger size. If you want to know more about arthritis including diagnosis, symptoms and treatment options, visit the arthritis section. If you don't think you've found the right arthritis knee brace for you, go to the knee brace guide for a greater range of braces.